July 28, 2010 Update: This post was featured on FoodBuzz Top 9 todayBoissevain is a small town in Manitoba that has left me a memory of cinnamon buns. I was working for 9 months and stayed at one of resident’s house. This town is only 20 minutes away from the US border of North Dakota. The town with 1,500 residents doesn’t only give me a memory of cinnamon buns, but also the warmness feeling from local people, The Station gift and coffee shop, beautiful murals and International Peace Garden. The lady who owns the house is very very nice person. We learned many things from each others. At this lady’s house, I introduced some Indonesian and Asian cooking. It ended up by exchanging recipe. I gave her, the Indonesian yellow chicken recipe which is her new favourite way to cook poultry. The original recipe is applying two consecutive ways, braise and deep fry. However, I told her to use braise and grill methods instead. She gave me a recipe of cinnamon buns that I love so much. With her permission, I shared her recipe with you. Please note these buns were made by A.G Diehl last February. Dissolve sugar in the water. Sprinkle with yeast and let stand for 10 minutes. Stir. Scald the milk; remove from heat. Stir in sugar & shortening. Cool to lukewarm and add to the yeast mixture. Stir in flour and eggs. Beat until smooth. Work in 3 more cups flour (preferably whole wheat). Turn flour on a floured surface and knead until smooth and elastic. Place in greased bowl. Cover an let rise in a warm place until doubled in bulk, about 1 hour. Punch dough down and divide in half. Roll each piece into an oblong about 1/2 “ thick, brush with butter, sprinkle wit h brown sugar and cinnamon, roll up like a jelly roll. Cut into 1” slices. Place, just touching each other in a greased pan. Bake at 350 degrees for 20 – 25 minutes. To make Chelsea buns put a quantity of walnuts, cherries and brown sugar in bottom of the pan before setting the buns in. 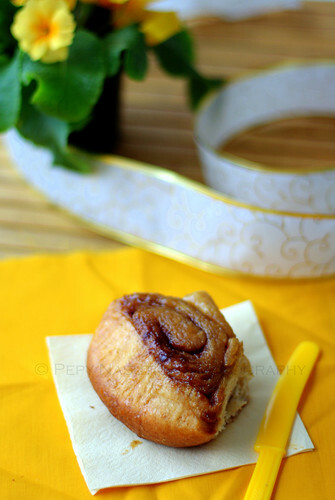 Cinnamon buns are something I crave constantly as well! These look quite dreamy! Yummy!!! Something I love to eat and smell!!! I love the shape! So cute! Hi Everyone,The cinnamon buns were made by my good friends. She shared the rcipe through my blog. I just took pics :)I will try this recipe by myself too. I will try this recipe by myself too. I have a week spot for this buns. Your shape turned out looking pretty. Looks very delicious. I love the smell of cinnamon. These would be so good with a cup of tea….mmmm. one of my most favorite foods in the world! This look heavenly! I'm going to have to try these out for my cinnamon-obssessed fiance 🙂 Congrats on Top 9!